City University London’s MSc degrees in aviation management, taught in the Dubai International Financial Centre (DIFC), are near full capacity again this year, but Programme Director, Captain Tilmann Gabriel, says more Emiratis need to receive training. Captain Tilmann Gabriel, Programme Director for City University London’s (City) aviation management programmes, has called for a plan to encourage more local talent to carve out a career in one of the United Arab Emirates’ (UAE) corner stone industries. 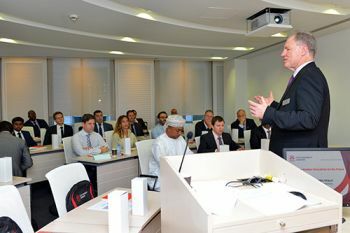 The diverse cohort from 23 different nations studying for MSc degrees in Air Transport Management, Air Safety Management and Aircraft Maintenance Management are part of a three year part-time course at City’s Dubai Centre in DIFC. “Dubai’s aviation industry has witnessed an incredible period of growth over the last two decades. In 2004, Dubai International Airport was not even featured on the Airports Council International’s top 30 busiest airports. Today, Dubai International Airport has overtaken London Heathrow as the world’s busiest for international passenger traffic, with over 70 million passengers expected to pass through in 2015." "As the local aviation industry continues to invest in skills and talent, education providers also have a huge role to play. For City University London, Dubai is the perfect location for our international aviation programmes. We aim to equip the next generation of aviation workers with the knowledge required to keep Dubai competing on a global scale." Nearly 1,100 students have now graduated from City’s MSc Aviation Management course and it currently has over 450 students, with over 150 of them in the Gulf. With nearly 40% of the global intake coming from the Gulf, this suggests the region has recognised the importance of ensuring those working within the industry receive the skills and knowledge they need to succeed and thrive. The aviation course material is delivered by experienced academics flown in from the City’s London campus, who teach directly to those working in the aviation sector and are seeking to enhance their professional experience to date through academic learning. The Dubai Centre was established in 2007 in collaboration with Dubai International Financial Centre (DIFC), as a regional centre of educational excellence for the Middle East and North Africa (MENA). The Centre operates as a not-for-profit venture and is licensed by the Knowledge & Human Development Authority (KHDA). It offers the internationally acclaimed Executive MBA (EMBA), three MSc programmes in Aviation Management, tailor-made executive education, short courses, business services including corporate partnership, consulting and high profile networking events for current students and alumni community in the region. The programmes offer executives and professionals in the region the opportunity to combine demanding work schedules with study near their home and work environments. The quality of education is guaranteed with London-based faculty flying in to provide the programmes. Mr Ehsan Razavizadeh has been the Director for MENA and Head of Dubai Centre since 2007.